You know your business would benefit from enhanced voice training and you are specifically interested in the pragmatic yet visionary approach of Vocal Awareness. You want to upgrade and enhance your company’s current leadership, communication, presentation and sales skills. You understand it is not just the “message” but the messenger that matters in every communication. You recognize that investing in the voices of your employees will yield significant return and enhance quality of life personally, professionally and environmentally. Now you are wondering how to get started. 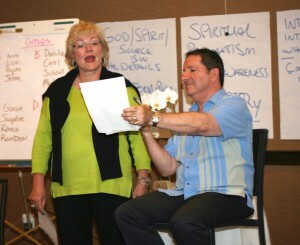 We offer two popular Corporate Training courses, individualized coaching and Custom Designed Communication Mastery Plans. Closely following the trajectory of Arthur Joseph’s newly released book Vocal Leadership: Seven Minutes a Day to Communication Mastery, the Vocal Leadership Seminar is uniquely designed to support businesses and business leaders develop stronger communication, presentation and performance skills. Research proves that the greatest impact speakers have in any conversation comes not only from the words they say but from the sound of their voices. In other words, it is not just the message but the messenger that matters in every communication. Topics covered include breathing techniques, vocal warm-ups, personal branding and Conscious Awareness. The Vocal Awareness Corporate Bridge is a fast paced, pragmatic and transformational exploration of how to most effectively, successfully and masterfully communicate both the message and messenger in every communication context. Using cutting edge techniques and exercises you will learn how to strategically practice performing as your best Self. This two day program features extensive practice, exercises, role playing, self-assessment and instructor feedback. 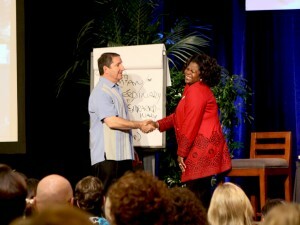 The Vocal Awareness Corporate Bridge is your path to business and vocal success, in other words Communication Mastery. Custom designed Vocal Awareness Programs are tailored specifically to you and your company’s strategic vision. After an initial consultation with you, we create a plan together which combines aspects of our most popular training options. The purpose as always is to help you and your company thrive in every business communication, creating Conscious Awareness in every interaction to maximize each opportunity. Individualized Coaching: Can be utilized in conjunction or independent of other seminars. Your Voice is your identity. It reveals everything about who you are and how you want to be known to the world. Private coaching will enhance your confidence, range, presence, pitch, stamina and storytelling. More importantly it will teach you how to make your inner Voice and your outer voice congruent. Your individual sessions will include training tools, plans and exercises designed specifically for your needs and goals. Sessions are always results driven and will help you define how you want to be known. By committing to private, consistent and targeted Vocal Awareness Coaching, you will become a more effective leader, making a greater impact on the world and feeling more confident in your Self. Discover the benefits of Personalized Coaching.